Monaco-based yacht builder Dynamiq has integrated Porsche design cues into its new GTT yacht range, starting with the 35m GTT 115 Hybrid. The round-bilge all-aluminium hull and hydrodynamic elements were developed by Vripack, and Porsche focused on the exterior styling. The Dynamiq GTT 115 Hybrid is powered by twin 1,626hp MAN diesel engines paired with two 20.8kW electric motors hooked up to the gearbox and twin 45kW Fischer Panda variable-speed generators. The Dynamic GTT 115 Hybrid has a top speed of 21kts (39km/h) and a range of 6,296km. 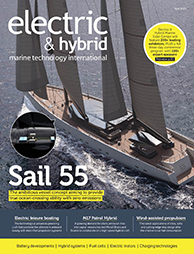 However, top speed is limited to 6kts (11km/h) while running purely on electric power. 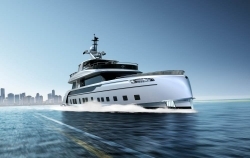 The Dynamiq GTT 115 Hybrid is currently being constructed at a shipyard in the city of Viareggio in the northern Tuscany region of Italy ahead of its grand reveal at the Monaco Yacht Show in September. The vessel is priced at US$13.4m and is limited to seven units.